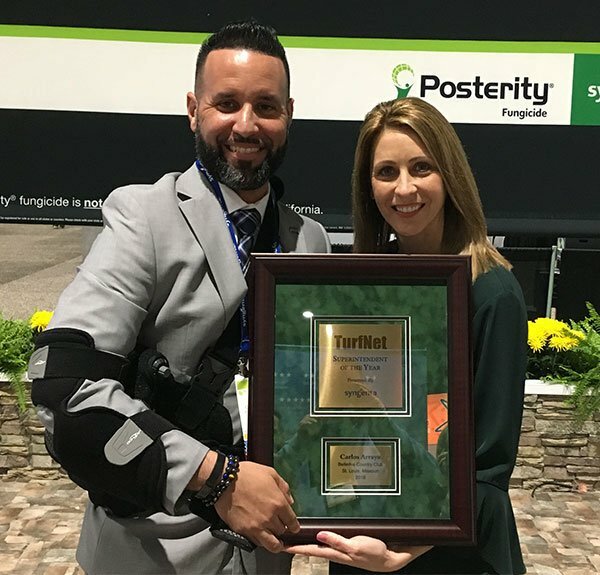 If Carlos Arraya’s nomination for the TurfNet Superintendent of the Year Award had been judged solely on what he endured while preparing for last year’s PGA Championship at Bellerive Country Club, that alone might well have been enough to win the award. But providing stellar playing conditions for the world’s best golfers was only part of the story at the historic club in St. Louis. How Arraya and his team accomplished that was the bigger story. In his fourth year at Bellerive, Arraya was named Superintendent of the Year by our panel of judges spanning the golf industry. 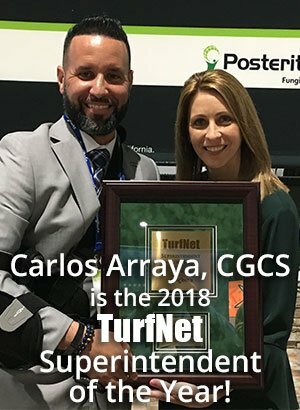 Sure, Arraya faced challenges while preparing for the PGA, including hot, humid conditions that nearly killed the greens just months after he started, an iron oxide layer and calcium carbonate buildup that was impeding drainage and trapped methane underground that was killing the grass from the bottom up. But it was his labor-management style -- largely the result of immense tragedy -- that captured the attention of our judges. Carlos Arraya, CGCS, with Stephanie Schwenke, turf market manager for Syngenta. Called pillar management, his management style focuses on employees first with the idea that the best people will produce the best product. It’s a philosophy that Arraya proves to employees how important they are by giving them ownership of the course and conditions. His focus on people-first is philosophy that was a result of losing his son, Isaiah, in a car accident in 2016. As the winner, Arraya and a guest will receive two slots on the TurfNet members golf trip to Ireland in the fall. Arraya was chosen from a field of five finalists that included Brian Conn of Transit Valley Country Club in East Amherst, New York; Dwayne Dillinger of Bell Nob Golf Course in Gillette, Wyoming; Pat O’Brien of Hyde Park Golf and Country Club in Cincinnati, Ohio; and Matthew Wharton of Carolina Golf Club in Charlotte, North Carolina. Read more about Carlos here.